Automate any workflow on your desktop and in the browser by taking screenshots. Record visual scripts in minutes! The Kantu can automate any website by taking screenshots. It allows you to visually automate your tasks, and makes web automation fun again. It lets you create solutions for web automation, web scraping or web testing in mere minutes. It's like the ultimate robot stand-in for all of your web browser automation needs! Whatever you used to do manually, Kantu can do automatically -- tasks like filling out forms, clicking on links, performing inquiries; you name it, Kantu can do it. Multiple page forms? Not a problem for Kantu: Install Kantu and download the Kantu Extension Modules. 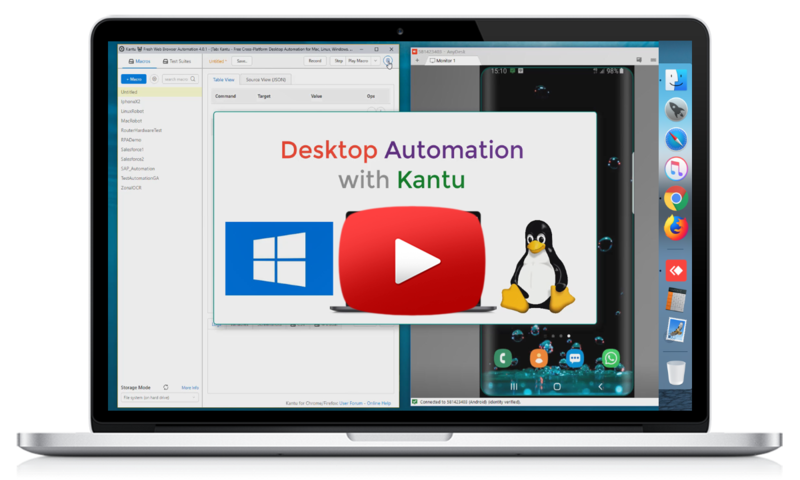 Kantu can automate any app on your desktop by taking screenshots, searching for images and reading text (OCR). It allows you to visually automate every Windows, Mac and Linux application. Android Emulator, Chrome, Firefox, Edge, Internet Explorer, File Explorer, Word, Excel, terminal sessions, remote desktop (RDP) connections - everything on your screen can be automated as series of images and text commands. Read more, and install Kantu and the Kantu Extension Modules. Robotic process automation (RPA) was never easier and faster. What makes Kantu web automation unique? Kantu is a hybrid solution. The Kantu Core implements all Selenium IDE commands, but Kantu also has "eyes", and understands the visual appearance of a website and desktop, just like a human does. Leave DOM, xpath, css selectors to the web developers. And even if you are a web developer – Kantu's visual approach speeds up web automation and RPA projects tenfold. Typical commands Click "Xpath=*[id='contentText'] /table/ tbody/tr /td/table/ tbody/tr/ td/table/tbody /tr/td/table /tbody/tr/td/strong"
Notice the difference? Download Kantu XModules and try it for yourself. I'm very impressed - in a few hours I was able to fully replicate a web app test setup that had taken a week or so to build in Visual Studio Gui testing. We selected your automation testing framework for its focus on simplicity and easy maintenance. Your software is perfect for what we need. We use Kantu/X/ to automate the process of extracting data files from our financial system and process the data for use by third party reporting software. This used to be a manual process which now takes place automatically over night. Data is now available at start of business day, whereas previously the manual process took up to two ours from start of business. Kantu made the automation of the procedure very easy and we are pleased with the functionality it provides. Get started: Download Kantu and the free XModules and start your visual automation project.